This description is from Lisa Rebori, the Museum’s Vice President of Collections. She’s chosen a selection of objects that represent our Museum’s history, and our collections of historical technologies, that we’ll be sharing here – and at 100.hmns.org– throughout the year. A sextant is a tool used for navigation and aids one in determining location. It could be used horizontally to measure the angle between 2 objects, like 2 lighthouses, or vertically for celestial navigation, to measure the altitude of a celestial object above the horizon. The distance, once calculated, could also provide a line of position on a nautical or aeronautical chart. Taking these measurements is known as sighting, or shooting, the object. 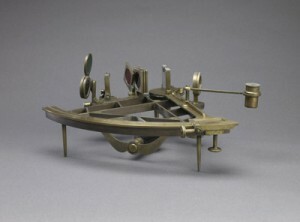 Historically, the most common use for the sextant was to sight the sun at noon to determine one’s latitude. The different colored filters allowed for the direct observation of solar measurements. A sailor could trust the results of the measurements, as they were taken relative to the horizon and not relative to the device itself – therefore, the results were much more precise. Also, since the images of objects being measured were bounced between two mirrors, the sailor could offset any inaccuracies caused by the motion of the boat itself. The margin of error for celestial navigation is about 0.1 nautical miles – approximately 200 meters. This is considered good, since a person can visually see several nautical miles. This device is still considered a practical back up tool for navigational purposes since it does not rely on electricity or satellites like our current GPS tools. The only drawback is that, if damaged, sextants are irreparable because the arc might bend – making all measurements taken most likely incorrect. So, having a case for the tool, as seen here in the photo, was essential. To ensure their integrity, most navigators would not even share their sextants with other members of their crew. Previous Post Ho, Ho, Hoax-Nay to the Nay-sayers!